If you would like to add your home-made costume to this site, simply fill out the submission form. Please provide detailed step-by-step instructions for creating your costume. I’m sure our visitors would thank you for providing them with great ideas. 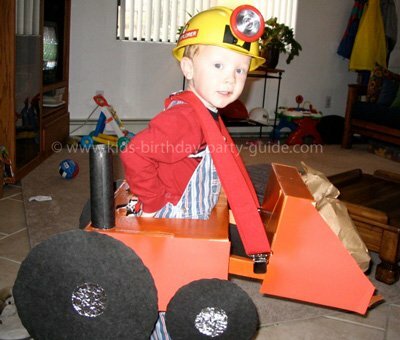 My son was 4 years old and just loved construction equipment, especially excavators. I looked all over to try and find a construction costume or an idea to make one, however, I found nothing. I saw a firetruck costume made similar to this, and that’s where I got my idea. I found a small picture of an excavator (from the side) to use as a guide. I’m not very good drawing freehand, so I photocopied it onto a transparency sheet, borrowed the overhead projector from our church and enlarged it. I contacted an appliance store to see if I could get an appliance box. They said I was welcome to anything in their dumpster. I don’t remember if it was a refrigerator or dishwasher box, but it worked great. Using the projector, I enlarged it to the size I wanted it, traced it with a pencil, then with a marker. I had a small rectangle box to use as the body. I cut a square out, more towards the front of the box, top and bottom, for my son to stand in. I cut out 8 separate pieces: 2 side panels, 2 ovals for the tracks, 2 pieces for the first part of the arm, and 2 pieces for the lower part of the arm including the bucket. Once I had all the pieces cut out, I tried spray painting, but the cardboard kept soaking up the paint and it was very dull. I ended up using poster board. I cut it out and used the spray glue to attached it to the cardboard. On each side panel I cut out a window. I cut the tracks out of black foam sheets and glued them on. When I cut the first pieces for the arm, I made them long enough so the bolts that hold on the tracks would go thru the arm. Another bolt was used to attach the end of the arm to the first part. The bucket was made out of 2 black foam sheets. I cut out 2 and glued one on each side, so there is no back side. We put a hole in the top part of the second part of the arm, threaded black yarn through. We made this long enough so my son could pull on it and make the bucket go up and down to make it look like he was scooping up dirt. It was really cool! So he didn’t have to worry about holding the box up, I cut out long strips of black felt, doubled it to make it as comfortable as possible on his shoulders, and stapled them to the box in front and in the back. I measured these to make sure the box would be at his waist. Make sure the straps are long enough to cross over either in the front or the back. To put the excavator costume on, he just had to step in the box, put the felt straps over his shoulders, and he was ready to go. It worked out really well. He wore a play construction hat. I cut the “CAT” logo out of orange foam, wrote on it with black marker. Made one of these for each side of his hat and just attached it with masking tape folded over. I made a “hard hat area” sign and glued it onto the back. I made a “Caterpillar” sign and put on the top of the back and on the front between the arms. The nuts and bolts we used were plastic ones from my son’s toy tool set. My husband helped with the assembly and put the bolts in and figured how to get the arm to move. It was a great costume! Our son played with his excavator long after Halloween was over. 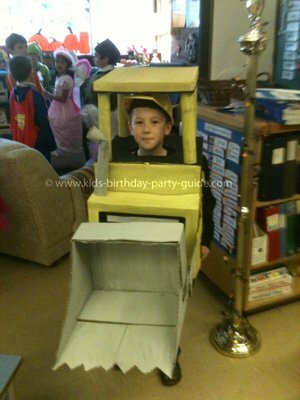 My son was obsessed with construction trucks and so for Halloween it was understood that he would be one … a front-end loader, to be exact! I started with a cardboard box that reams of copy paper come in (including the lid). I cut an opening in the box with an X-acto knife for my son to step into. For the bucket part, I took the lid and made a cut along the top of the lid (but not all the way through) so that I could fold it to a 90 degree angle. I used my hot glue gun to glue the loader in that L-shaped position. Next I took two sticks that you use to stir paint (you can pick them up from Home Depot) to use as the arms of the loader. I made a cut on either side of the box and on either side of the back of the bucket and slid the paint sticks into each matching slot. I then hot glue gunned them into place. Next I took the whole thing outside and spray painted it orange. After it was dry, I used some orange construction paper to make the sides of the bucket: I cut two large triangles and then cut off the tips and glued it to the sides – that made the bucket complete. For the smoke stack, I rolled a piece of black construction paper into a tube, glued it shut and then glued it to the top of the box. For the tires, I cut two large circles and two smaller circles out of black poster board. I made the cut around the outside bumpy so that it would look like tire tread. I used crumpled up foil for the hubcaps. Next it was time for the boulders in the bucket. I used several paper lunch sacks and stuffed them with newspaper and then crumpled them up. I glued each into the bucket so they would be secure. Finally, I bought a pair of suspenders to hook to the back and sides of the truck to go over my son’s shoulders. We topped the whole thing off with overalls and a hard-hat! I made this for a student in my class. He loves ‘diggers’. I was in the process of making something for myself out of a cardboard box and it just didn’t work out. I put the box in the corner and as I was staring at it for inspiration I thought of this particular boy and I thought this would make a good ‘digger’ costume for him for Halloween. When he told me he didn’t have a costume, I knew I had to make it for him. The body of the digger is a square box with the head and arms cut out. I used wrapping paper tubes to make the posts of the roof – I hot glued them to the roof made from the lid of another box. I used a fifth wrapping paper tube to make the exhaust pipe that I bent and glued on. I used a thinner piece of cardboard and folded it to make the front overhang. The ‘bucket’ is made from the corner of another box and cut along the bottom to look like the claws. I attached two cardboard arms to the bucket with a nut and bolt and then attached it the same way to the body of the digger so that the bucket can be moved up and down. The tires and the grill details are made from thinner pieces of scrap cardboard.